To say a great deal of skepticism attended the Constitutional Convention would be an understatement. After all, a previous attempt to strengthen the national government through amendments to the Articles of Confederation failed to draw a quorum at the Annapolis Convention in 1786, where only five states thought the matter worth discussing. (The Articles, adopted in 1777, were not ratified by all 13 states until 1781). So when delegates such as Oliver Ellsworth from Windsor, William Samuel Johnson of Stratford, and Roger Sherman from New Haven, entered the Pennsylvania State House (now known as Independence Hall) and locked the doors and windows in the muggy summer of 1787 to ensure secrecy, few expected much to come from it. Yet what happened became known as “a bloodless coup d’etat,” since the country’s leaders did not revise the Articles of Confederation, but completely replaced it with a substantially new document, the US Constitution. It is important for Connecticut residents to remember the unauthorized dismantling of one form of government in favor of a new framework would not have happened if not for the so-called Connecticut Compromise. Big states rightly argued that democracy required the majority rule, so proportional government needed to be the standard. At the same time, small states like Connecticut demanded votes be counted equally for each state. Sherman’s 1776 proposal for a bicameral legislature was re-introduced in an attempt to end the stalemate. Bicameral legislatures were not the invention of the Connecticut delegation, since British Parliament used that system beginning in 1707. What brought attention and lasting fame to Connecticut was Sherman’s brilliant idea to get the big states to accept sharing power in a bicameral system in exchange for putting the large-state-dominated House of Representatives in charge of the nation’s purse strings. On September 17, 1787, 38 of the 41 attending delegates signed the US Constitution. 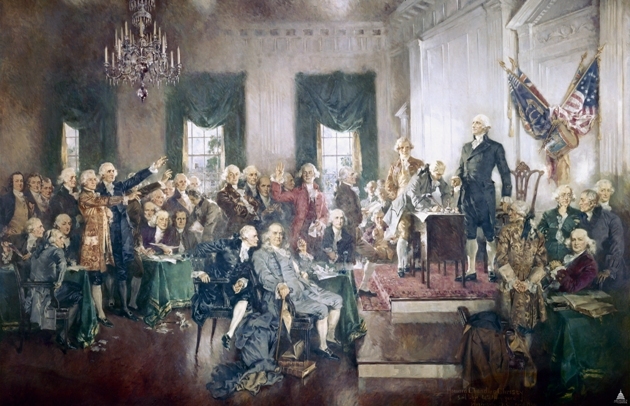 In the wake of this success, Thomas Jefferson called Sherman “a man who has never said a foolish thing in his life.” If the Fundamental Orders were not reason enough to declare Connecticut the Constitution State, the Connecticut Compromise secured the claim. John Morrison, who teaches US History at Moran Middle School in Wallingford, is a participant in the Teaching American History program of the US Department of Education and a Civil War re-enactor with Company F 14th Connecticut Volunteer Regiment; he holds a BA from New England College as well as an MA and Sixth Year Professional Diploma from Southern Connecticut State University. “Connecticut in the Constitutional Convention: Curriculum Unit.” Yale-New Haven Teachers Institute, 2017. Link. “Delegates to the Constitutional Convention: Connecticut.” University of Missouri-Kansas City School of Law, 2017. Link. “Educational Resources.” National Constitution Center, 2017. Link. “Interactive Constitution.” National Constitution Center, 2003. Link. “The Constitution of the United States: Questions and Answers.” National Archives, 2012. Link. “The Constitutional Convention.” Teaching American History, 2017. Link. “America Gets a Constitution.” History.com, 2012. Link. “U.S. Constitution Vignette.” C-Span Classroom, 2013. Link. “Charters of Freedom - The Declaration of Independence, The Constitution, The Bill of Rights.” National Archives, 2017. Link. “Constitution of the United States (1787).” National Archives, 2017. Link. Stewart, David O. The Summer of 1787: The Men Who Invented the Constitution. New York, NY: Simon & Schuster, 2007.